The next morning I got up at 8am. As the Hungarian was still sleeping I decided to have breakfast first before packing my bag. At 9am sharp I left the hostel, took a deep breath in, said hello to all my fears (will I be able to find the way, a hostel, talk to people, will I get attacked by dogs, cows, humans…) took a deep breath out and let go of all my fears. The rain had just stopped and the air was crisp. 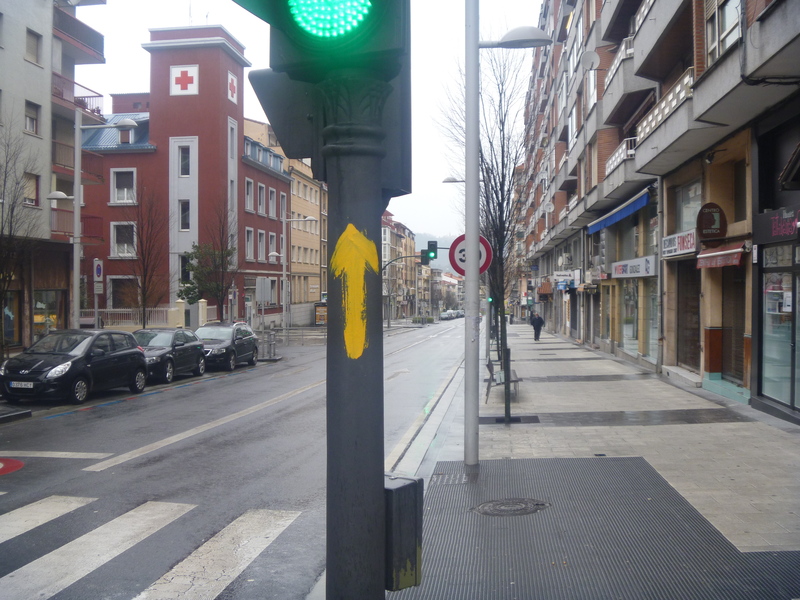 The first few kilometres lead me through the city of Irun and that’s where I discovered the first yellow arrow. Yay! 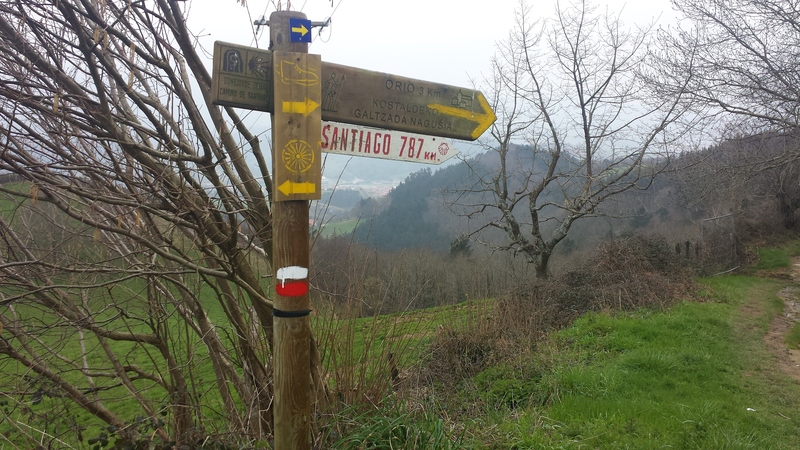 The sign which would lead me safely back to Bilbao in 7 days. 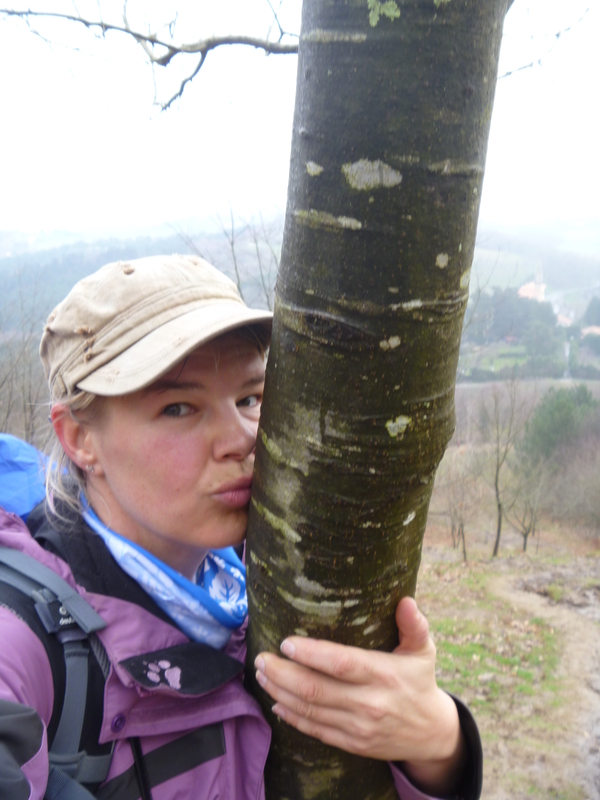 Shortly after leaving Irun I found myself in the beautiful Basque countryside. To be honest, it looked more like Switzerland or maybe even France with all its hills, meadows, cows etc. I passed lots of farms, but there were hardly any people out there. A few dogs were glaring at me and I picked up some pebbles to be prepared for any vicious attacks. Although I was worried about walking by myself before it seemed just the right thing to do. I enjoyed the peace and the calm without any more new information to process. There was enough on my mind to process anyway and the first few days my mind was still spitting out thoughts continuously before it finally calmed down. Walking has such a liberating effect. It feels like with every step you can breathe a little better, you free yourself from all your thoughts and at some point you just walk – almost in a meditative state. 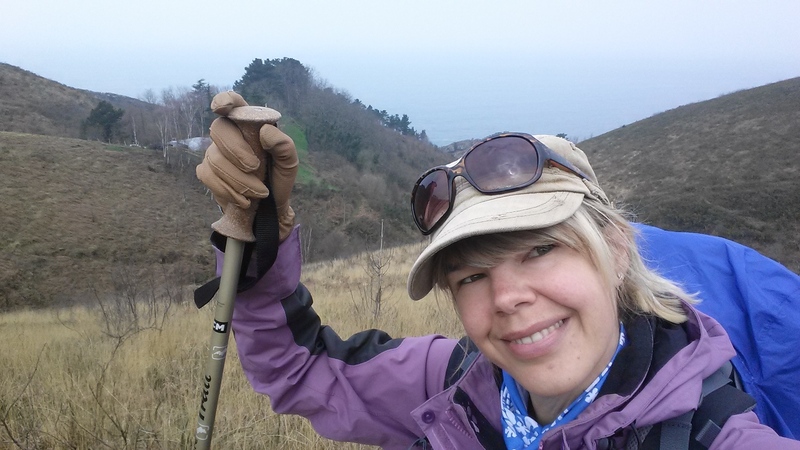 After reaching a beautiful plateau overlooking Irun and the coast the path descended into the small village of Pasaia. 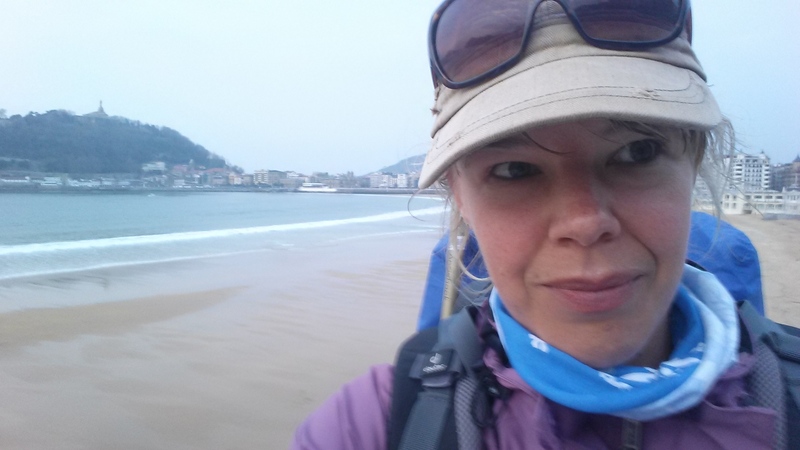 After spending a few hours without seeing anybody, bustling Pasaia felt almost a bit overwhelming. On the ferry I ran into the Hungarian again and the next few hours we walked together. The path went along the coast and offered some magnificent views. The Hungarian, a very chatty chap, amused me with his ideas to “100 spectacular ways to die as a pilgrim”. When we finally arrived in St Sebastian, my destination for the day, I was knackered. I had been walking for almost 9 hours and let me tell you this, Northern Spain is actually NOT flat. Unfortunately, I had another sleepless night… why do people have to snore??!! Thankfully I found a coffee shop close by and after the first coffee my brain slowly switched back on… The first part of the trek lead me through the outskirts of St. Sebastian. It was drizzling and everything looked a little grim to me (could have had something to do with the sleep deprivation). 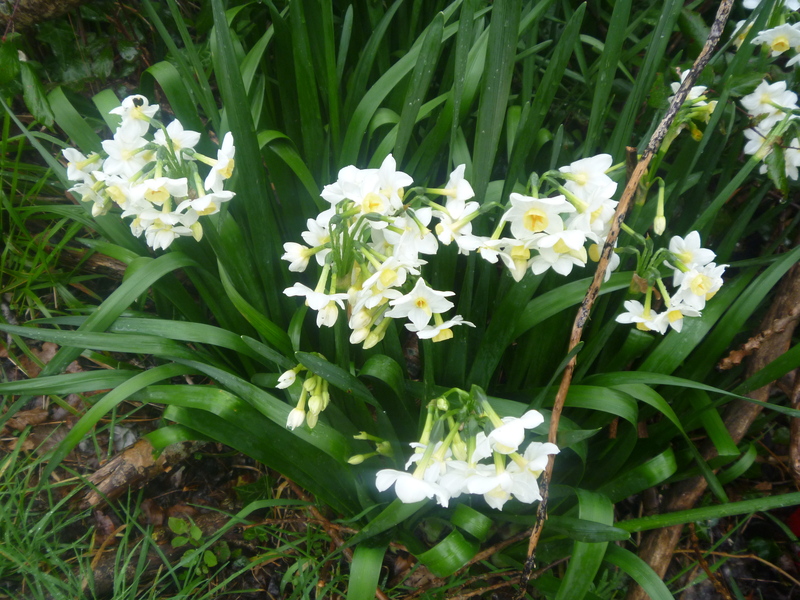 But then there is life and all its little beautiful surprises. 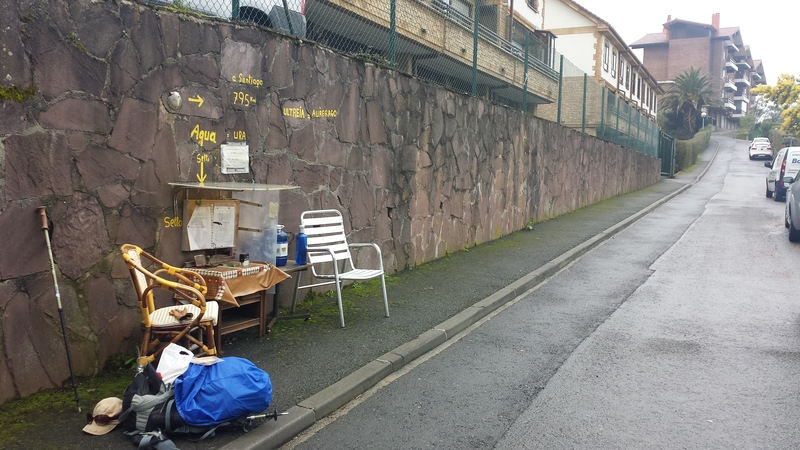 In the middle of the road someone had set up a table, chairs and water for the pilgrims who pass by. He also put up a sign: no money please, just enjoy! How lovely was that. I sat down for a moment and the lovely man, whose idea that was, joined me. His German was excellent and he told me he was just listening to an English podcast to practise his English. What a lovely person. When I continued my journey, I felt much more positive. The kindness of other people can be so energising. 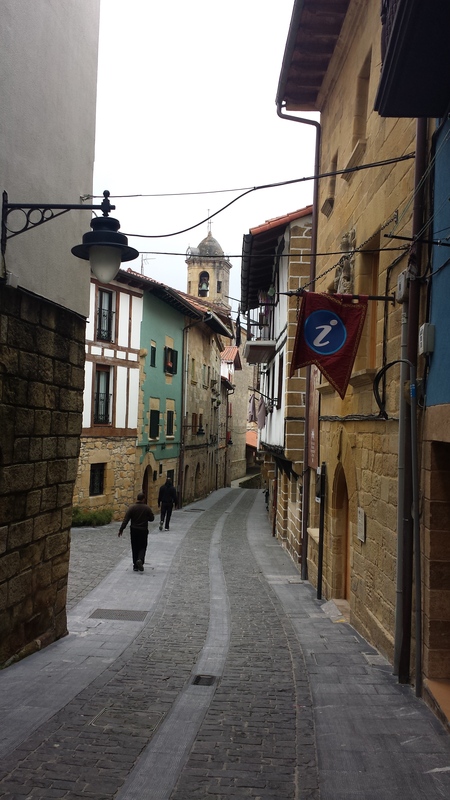 The next few hours I spent in the Basque countryside again before reaching the little town Orio. Again, people were super friendly. Lots of people greeted me with “Bon camino” or “Bon viaje” when they saw me. After leaving Orio the path followed the coast. The weather cleared up and offered the most amazing views. I had to stop every few minutes to just stand or sit still and enjoy the scenery! 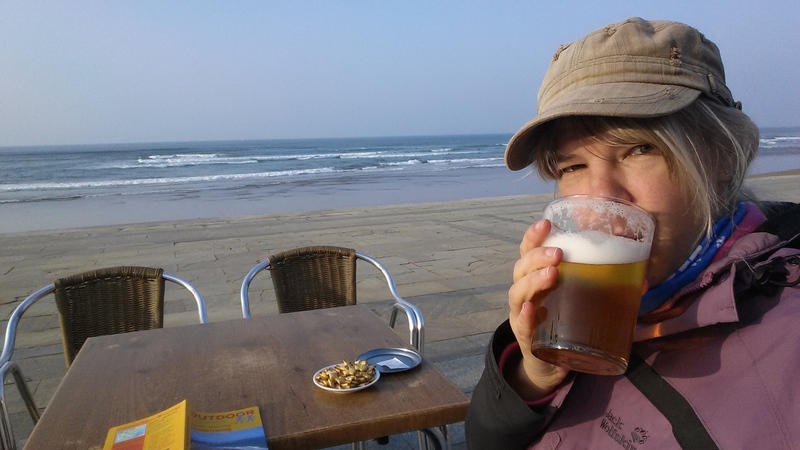 When I got to Zarautz, I had some difficulties finding the albergue first. But after asking a few people: Hola, donde esta albergue and receiving a long answer in Spanish (which of course I didn’t understand) I finally found someone who was a master in sign language and that helped. Although I thought I was the only one in the albergue a school class showed up later. So it was actually not just me there but it was me PLUS 100 crazy children. Anyway, having the room all to myself plus earplugs finally granted me the so much needed 10 hours sleep.